The Yugoslav Left (Serbo-Croatian: Југословенска Левица, ЈУЛ / Jugoslovenska Levica; JUL) was a left-wing political party in the Federal Republic of Yugoslavia. At its peak, the party had 20 seats in Republic of Serbia's National Assembly following the 1997 general election. The party was formed in 1994 by merging 19 left-wing parties, led by the League of Communists – Movement for Yugoslavia (SK-PJ). It was led by Mirjana Marković, originally holding the title of President of the Directorate. League of Communists – Movement for Yugoslavia was a political party formed by members of the Yugoslav People's Army in 1990 active in Serbia. The party was based on former party organizations within the army. In 1994 it joined the Yugoslav Left party led by Mirjana Marković. Mirjana "Mira" Marković was a Serbian politician and wife of former Yugoslav and Serbian president Slobodan Milošević. She was the president of the now defunct Yugoslav Left political party from 2002 to 2003. Marković, who was wanted for fraud charges, lived under political asylum in Russia from February 2003 to her death on 14 April 2019. The Socialist Party of Serbia is a political party in Serbia that identifies as a democratic socialist and social democratic party. The Socialist Party of Serbia was the direct descendant of the League of Communists of Serbia. Throughout its existence, the party has utilised some nationalist rhetoric and themes, and has therefore been labelled a Serbian nationalist party, although the SPS has never identified itself as such. 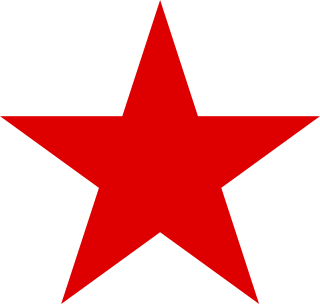 The League of Communists of Serbia, founded as the Communist Party of Serbia in 1945, was the Serbian branch of the League of Communists of Yugoslavia, the sole legal party of Yugoslavia from 1945 to 1990. It changed its name from KPS to SKS in 1952. Under a new constitution ratified in 1974, greater power was devolved to the various republic level branches. In the late 1980s, the party was taken over by a faction endorsing Slobodan Milošević to become leader of the party. Milošević appeased nationalists in Serbia by promising to reduce the level of autonomy within the autonomous provinces of Kosovo and Vojvodina. This policy increased ethnic tensions with the other republics and nationalities. During the early 1990s, the growing ethnic tensions between the republics of Yugoslavia led to the breakup of the federal party. In politics, crossing the floor is when a politician changes their allegiance or votes against their party in a Westminster system parliament. Crossing the floor may be voting against the approved party lines, or changing to another party after being elected while a member of a first party. While these practices are legally permissible, crossing the floor can lead to controversy and media attention. As well, voting against party lines may lead to consequences such as losing a position or being ejected from the party caucus. In 1996, the JUL joined the Left Coalition with the SPS and New Democracy. Following the 1997 election, the party had 20 MPs and representatives in various local assemblies. It held five ministerial posts in the second cabinet of Mirko Marjanović. It had a minimal presence in Montenegrin politics. At its peak, the JUL was part of the Patriotic Coalition for Yugoslavia in the 2002 election with the People's Socialist Party of Montenegro, and the Serbian Radical Party. The coalition won less than 3% of the vote and no seats. The Socialist People's Party of Montenegro is a socially conservative social-democratic opposition political party in Montenegro. It is part of the Key Coalition, an opposition political alliance in Montenegro. It has 2 of 3 MPs which it won in the 2016 parliamentary election. The party is pro-European Union and anti-NATO. Vuk Drašković is Serbian writer and politician. He is the leader of the Serbian Renewal Movement, and served as the Deputy Prime Minister of the Federal Republic of Yugoslavia and the Minister of Foreign Affairs of both Serbia and Montenegro and Serbia. Ivica Dačić is a Serbian politician who has been the Minister of Foreign Affairs since April 2014. He is the leader of the Socialist Party of Serbia. Coalition for a European Montenegro was the ruling political alliance in Montenegro headed by Milo Đukanović's Democratic Party of Socialists (DPS). The Serbian Renewal Movement is a national liberal and monarchist political party in Serbia. Radoman Božović is a Serbian politician and former Prime Minister of Serbia. Together for Change was a populist political alliance in Montenegro that existed from 2001 to 2006, originally known as Together for Yugoslavia. It based itself upon the necessity for a united Yugoslav state with Serbia. Predrag Bulatović was its wingleader. The pro-European semi-conservative coalition also based itself on economic and democratic reforms, bringing down of the authoritarian regime of Milo Đukanović. The Left Coalition was a coalition of left-wing political parties in Serbia for the 1996 Yugoslavian parliamentary election and then for the 1997 Serbian general election. The coalition was made up of the Socialist Party of Serbia (SPS), Yugoslav Left (JUL) and New Democracy (ND). It was led by Slobodan Milošević the leader of SPS, but also main actors were Mirjana Marković the leader of Yugoslav Left and Dušan Mihajlović the leader of New Democracy. Following the 1997 election, it formed a coalition government with the Serbian Radical Party (SRS). In 1998 ND left the coalition and after the defeat in the 2000 Yugoslavian general election the Left Coalition was disbanded. Dušan Bajatović is a politician, entrepreneur, and administrator in Serbia. He has served in the National Assembly of Serbia since 2007 as a member of the Socialist Party of Serbia and is a former member of both the Assembly of Serbia and Montenegro and the Assembly of Vojvodina. Once an ally of Slobodan Milošević, he was later a prominent advocate of moving the Socialist Party away from Milošević's legacy. Since 2008, he has been the general manager of the powerful public utility Srbijagas. Nada Kostić is a medical doctor, academic, and politician in Serbia. She briefly served as Serbia's minister of health in the transitional government that was established after the fall of Slobodan Miloševic's administration in 2000. Kostić was awarded a mandate for the National Assembly of Serbia on 17 April 2018. She is a member of the Democratic Party but serves in parliament as an independent deputy. Dijana Vukomanović is a politician in Serbia. She has served in the National Assembly of Serbia since 2012, initially as a member of the Socialist Party of Serbia (SPS) and subsequently with the People's Party. She also serves on the Assembly of the City of Belgrade. ↑ Steele, Jonathon (2000). "Yugoslavia's hated regime crumbles". Guardian. Retrieved 9 January 2018. ↑ Breuilly, John (2013). The Oxford Handbook of the History of Nationalism. OUP Oxford. p. 527. ↑ Golubović, Zagorka (2003). Politika i svakodnevni život: Srbija 1999-2002. IFDT. p. 225. 1 2 Janusz Bugajski. Political Parties of Eastern Europe: A Guide to Politics in the Post-Communist Era. Armonk, New York, USA: The Center for Strategic and International Studies. p. 407. 1 2 3 "Yugoslav Left". Free Serbia. 10 December 1999. Retrieved 28 March 2019. ↑ Thomas 1999, pp. 225-6. ↑ "MIRJANA MARKOVIC IZABRANA ZA PREDSEDNICU JUL-A" (in Serbian). B92. 6 April 2002. Retrieved 4 April 2019. ↑ "Mira Marković danas nema šanse kao politički lider". srbijadanas.com. Srbija Danas. 28 March 2015. Retrieved 20 March 2018. Thomas, Robert (1999). Serbia Under Milošević: Politics in the 1990s. London: Hurst & Company. ISBN 1-85065-341-0 . Retrieved 4 April 2019.